CFOs can be a funny bunch. Case in point: many want to see growth in their companies, but are reluctant to invest the money necessary for that growth. Unfortunately for them, companies don’t grow on sunshine and water. They need investment. According to Ernst & Young’s latest CFO Capital Confidence Barometer, 55% of the 376 CFOs surveyed say the companies they work for are focused on growth. Plus, 60% of them say they believe the global economy is improving, which is a huge jump from the previous year when jut 26% said that. And 44% of them also say they plan to invest capital over the next year rather than raising, preserving or optimizing capital. And while all this points to focusing on growth, as CFO magazine’s Marielle Segarra points out, the survey also reveals the way chief financial officers plan to invest capital is rather conservative. Just 28% of those surveyed planned to pursue an acquisition and most of them weren’t planning to invest in new products, services or research but rather invest in gaining market share for existing products or invest in expanding their markets. As for the where, 54% of surveyed CFOs said they are considering trying to break into new geographical areas or product sectors, but 61% said they are planning to stick with their existing offerings and will try to grow by luring customers or clients away from competitors. This cautiousness is understandable in light of the relatively recent struggles of the economy, which are still fresh in the minds of most people, especially financially-minded CFOs. It’s likely that CFOs are just taking safe steps rather than big risks. It’s similar to walking on ice that you’re unsure of; you slide a foot forward and test how strong it is before you slide your other foot forward and do it again. The last financial crisis was probably the first big one in the lives of most of the current crop of CFOs and now that they see how quickly things can go south, they’re not eager to take too many risks until they see the economy, like the ice, is solid underneath them giving them the confidence to take that next step. It’s a bit of a conundrum, as CFOs appear to be cautiously waiting for the economy to improve more before they start taking risks in the interests of growth, but then if they’re not willing to take those risks, it hampers the economy’s recovery. 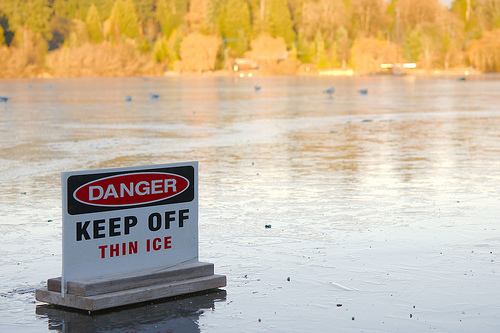 But that ice will thicken eventually.